Deema K. Shehabi is a Palestinian-American poet, writer, and editor. Author of the poetry collection Thirteen Departures from the Moon, she also collaborated with Marilyn Hacker on DIASPOR/RENGA, an email exchange between the two poets, of Palestinian and Jewish heritage respectively, sparked by the 2009 Israeli siege of Gaza, published as a single long poetic dialogue. 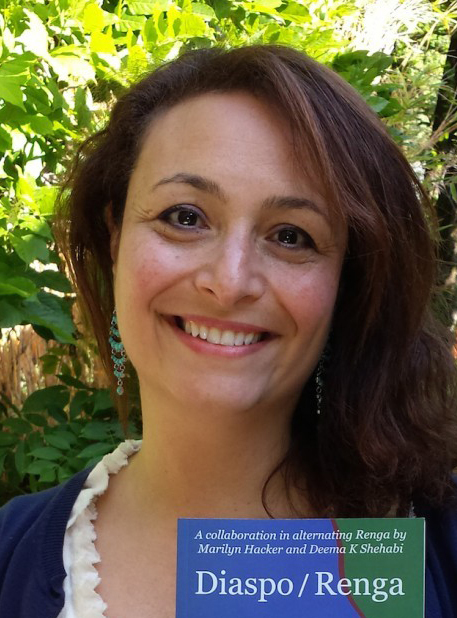 Another of her collaborative publications is Al-Mutanabbi Street Starts Here, co-edited with Beau Beausoleil for which she won the Northern California Book Reviewers Special Recognition Award. An American poet of Palestinian, Jordanian and Syrian heritage, Lena Khalaf Tuffaha's debut book of poems is Water & Salt. Oliver de La Paz says, "The poems in Water & Salt are fearless and frank. They speak of a place where a phone call announces doom and where 'portraits find their frames.' But always, despite the violence and war, in the music of Tuffaha's poetry there is a clear summons, beckoning us to join her in the feast of her language." Widely published in literary journals, she is also the winner of the 2016 Two Sylvias Chapbook Prize for Arab in Newsland.